Finally a Barbie I can relate to! At long last, here are some NEW Barbie dolls to coincide with her vintage and me getting older. These are a bit more realistic. Bifocals Barbie. This vintage Barbie comes with her own set of blended-lens fashion frames in six wild colors (half-frames too! ), neck chain and large-print editions of Vogue and Martha Stewart Living. Hot Flash Barbie. For this vintage Barbie, Press Barbie’s bellybutton and watch her face turn beet red while tiny drops of perspiration appear on her forehead. Comes with hand-held fan and tiny tissues. Facial Hair Barbie. 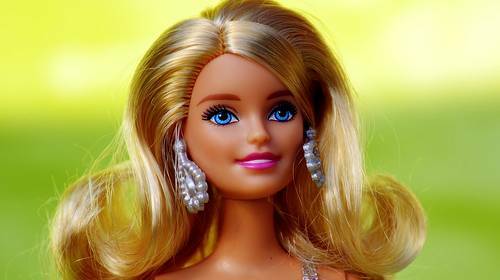 As Barbie’s hormone levels shift with our next vintage Barbie, see her whiskers grow. Available with teensy tweezers and magnifying mirror as Barbie comes of age. Flabby Arms Barbie. Hide vintage Barbie’s droopy triceps with these new, roomier-sleeved gowns. Good news on the tummy front, too – muumuus with tummy-support panels are included. Bunion Barbie. Years of disco dancing in stiletto heels have definitely taken their toll on this vintage Barbie’s dainty arched feet. Soothe her sores with the pumice stone and plasters, then slip on soft terry mules. No-More-Wrinkles Barbie. With our next vintage Barbie you too can erase those pesky crow’s-feet and lip lines with a tube of Skin Sparkle-Spackle, from Barbie’s own line of exclusive age-blasting cosmetics. Soccer Mom Barbie. All that experience as a cheer-leader is really paying off as vintage Barbie dusts off her old high school megaphone to root for Babs and Ken, Jr. Comes with minivan in robin-egg blue or white, and cooler filled with doughnut holes and fruit punch. Too Many Donuts Barbie. That's right. Not just doughnut holes. More doughnuts here and there, super size those French Fries and Big Macs®, "Dessert? Sure, I'll have the death-by-chocolate double decker cake. It all adds up. Too Little Exercise Barbie. Mixed with excessive eating habits, backing off the treadmill, no more StairMaster, barely a walk in the park has also taken it's toil on Barbie's trademark figure. Post-Menopausal Barbie. This vintage Barbie wets her pants when she sneezes, forgets where she puts things, and cries a lot. She is sick and tired of Ken sitting on the couch watching the tube, clicking through the channels. Comes with Depends and Kleenex. As a bonus this year, the book “Getting In Touch with Your Inner Self” is included. "Yes, they are ready for the Zombie Apocalypse and a masters at Minecraft, but not ready for the Math Test tomorrow." "Don't change so people will like you. Be yourself and the right people will love you." "Raising a teenager is like getting pecked to death by a chicken." ~ parent. "As kids, we wondered why our parents were always in a bad mood. Now we're like . . Oooooohhhhhhh." "You realize you are moving from the pre-teen stage to full blown teenager when you realize you've worn the same pair of jeans for 6 days without washing them."